This editorial appeared in Better Investing magazine back in April 2000 in response to a widely-circulated “research paper” that assailed investment club performance. 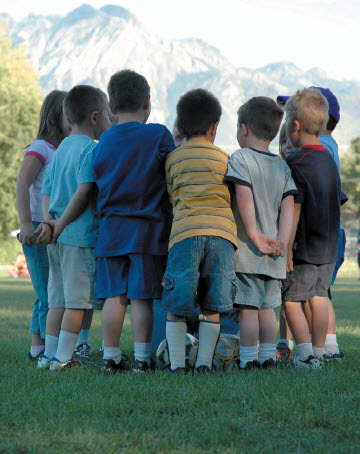 In my opinion, investment clubs unleash stewardship and deliver the potential for better futures to all who come to understand the philosophy and methods. We’ve acknowledged in past articles that George Nicholson always regarded NAIC and investment clubs as his “Grand Experiment.” Investment clubs are also human. The things that can be discovered are nothing short of miraculous. Exploring the rewards of investing while stripping away the myth and mystery is something that brings a smile to our faces. Learning to smile together is a gift that we hope to share with as many people as humanly possible. We have “been here” before and it won’t be the last time. A year ago, a number of publications assailed our Beardstown Ladies. Too many cooks? Most of us rather like cooking with our friends. There is some impressive cookin’ going on. There will come a day that we’ll demonstrate that we not only achieve (in the words of Barber and Odean) “savings, education, friendship and entertainment . . .” but we also achieve very promising performance levels as well. Collectively, NAIC investors achieve high returns. Clearly, this does not happen for every single club or every individual, but we have scores of success stories. We think it’s valid to point to our Top 100, this issue’s main feature, as substantial evidence. With Intel, Lucent Technologies, Home Depot, Cisco Systems, Merck, PepsiCo and Microsoft among the most widely held companies, clearly somelevel of success has been attained by our practitioners. Barber and Odean include another rehash of the Beardstown Brouhaha of 1999 as “evidence” of poor performance. It bears repeating. 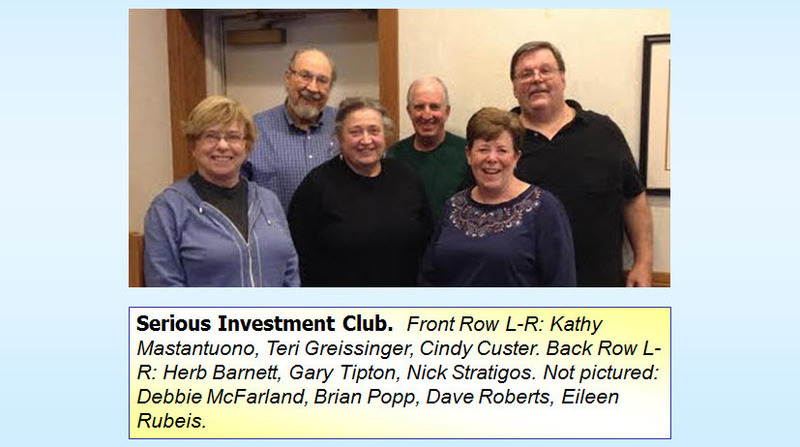 Investment clubs, including our Beardstown Ladies, are human. A mistake was made. But, for the record, the Beardstown Ladies achieved a 15.3 percent annualized return for the 14 years ended in 1997. (This was part of the Price Waterhouse audit.) The annualized return for the S&P 500 for this same 14-year period was 16.9 percent. If the ladies are guilty of under performance, consider this: In his book, Common Sense on Mutual Funds, John Bogle Sr. documents that only 14.1 percent of “growth and value” mutual funds beat the Wilshire 5000 (16.0 percent returns for the total market) for the 14 years ending in 1997. While committing their “crime,” our Beardstown Ladies “defeated” 5-out-of-6 mutual funds. Is the point that the ladies would have been better off stuffing their recipes and cold cash into the corners of their mattresses? I certainly hope not, because if that’s the case, these two educators are not only failing to educate — they’re DE-educating. A number of us recently gathered online to discuss James O’Shaughnessy’s book, What Works on Wall Street. What works on MAIN Street? Patience. Discipline. Discovering the best companies, at the best prices, with our friends. Too many cooks? Not even close! It’s the best type of cooking capitalism has to offer. 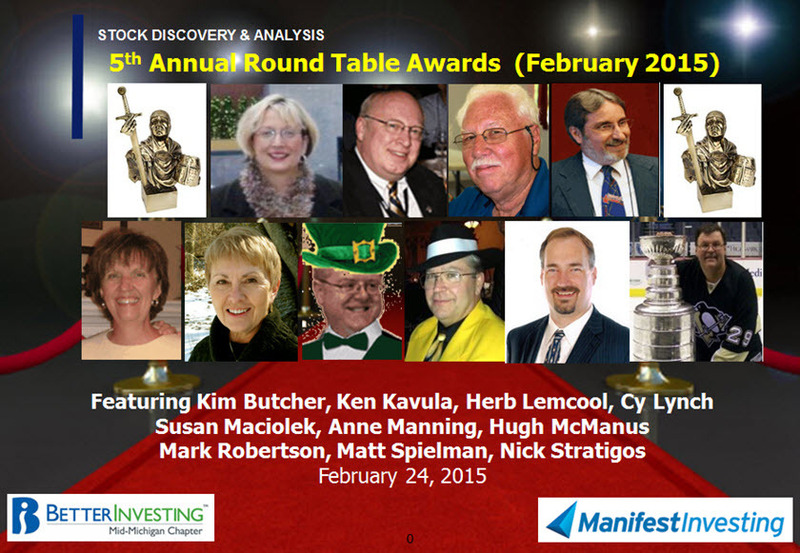 You’re invited to join us as the colleagues of the Round Table present their favorite stock study ideas at the February session. It’s our annual black tie over suit-of-armor extravaganza as we’ll also honor the best moments and decisions of 2014 and since inception of the Round Table five years ago. For those of you who watched the Super Bowl (and those of you who watch the commercials and halftime show), recall that Katy Perry rode into the stadium for the halftime extravaganza on a huge lion, singing about roaring like a champion? One of her hit songs is entitled, This Is How We Do. I didn’t know what “stuntin” actually referred to but based on this urban dictionary rendition, we think it applies to all things Groundhog. Hugh McManus of Pasadena and the Serious Investment Club of Pittsburgh are the latest in a long line of stuntin legacy — taking home top honors for Groundhog Challenge VIII in the individual and group categories. Collectively, we “chill, lay back” and select a basket of 5-20 stocks that will go unchanged over the course of the Groundhog Calendar. Over the years, we’ve noticed very little swinging for the fences. A few participants will try to isolate a promising deep value situation with a potential catalyst that could deliver over the course of a year. But for the most part, the participants select high-quality stocks that would be suitable for the long term, a time horizon measured in years, if not decades. We kick off this performance results summary with a look at the collective performance over eight years where the average annualized return is 10.0% during a period when the Wilshire 5000 delivered 6.6% annualized returns. The following table presents the leader board at the conclusion of the 2014 stock picking contest. 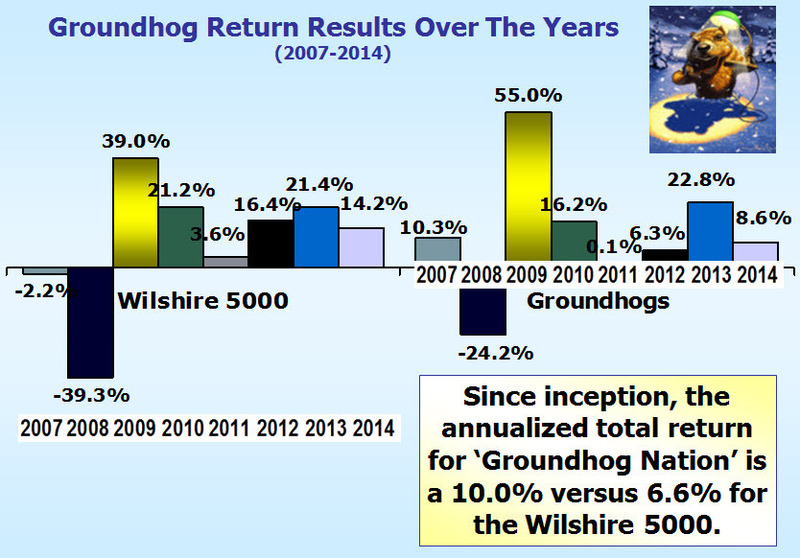 $1,000,000 invested on Groundhog Day (2/2/2014) became what is displayed here. 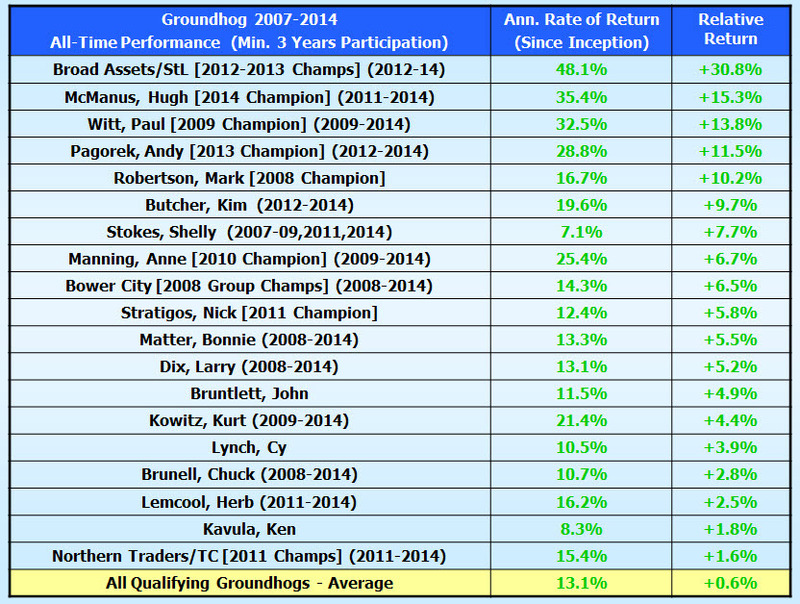 Here are the consensus favorites from the entries in Groundhog Challenge IX (2015). It was a dead heat between QUALCOMM (QCOM) and Cognizant Technology (CTSH). The figures in parentheses are the number of times a stock appeared among the 2015 entries. It’s a solid list across the board with an overall PAR of 15.1% and an average quality rating of 91. Collectively, these selections rank in the top 7th percentile of all stocks based on return forecast and quality ranking. 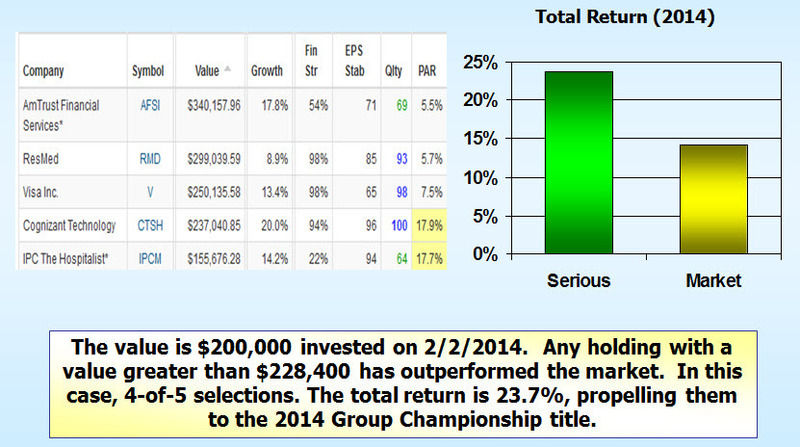 The average Value Line low total return forecast is 11.1% (vs. 3-4% for the Value Line 1700). The price-to-fair value ratios according to Morningstar and S&P are also quite favorable … as well as the 1-year total return forecast (+20.3%) based on consensus 1-year price targets (and current yields). The last few years have been pretty good to the Dow 30 stocks — after spending the first ten years of this century in the dog house. The trailing 5-year annualized return is 15.0% versus the Wilshire 5000 at 16.8%. So the other 4970 stocks have actually continued to outshine the Dow 30. In keeping with some of the Groundhog shopping, we also display the 1-year outlooks based on analyst consensus and S&P target prices. Nutshell: Microsoft (MSFT) and General Electric (GE) are consensus favorites. S&P thinks JP Morgan (JPM) is a steal. There’s an IBM (IBM) bandwagon at Morningstar. Value Line is skeptical about the long-term forecast for Disney (DIS), Cisco Systems (CSCO) and Home Depot (HD). 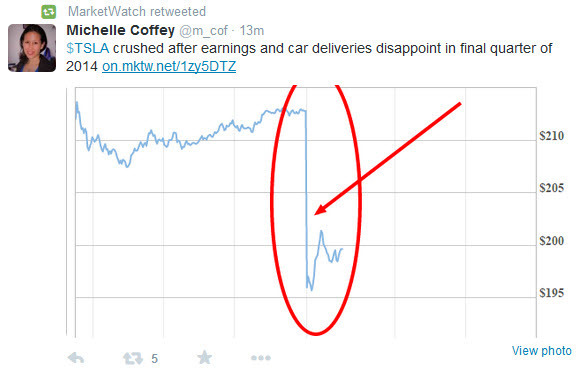 S&P doesn’t want Coca-Cola (KO) … not even with a 10-foot pole. 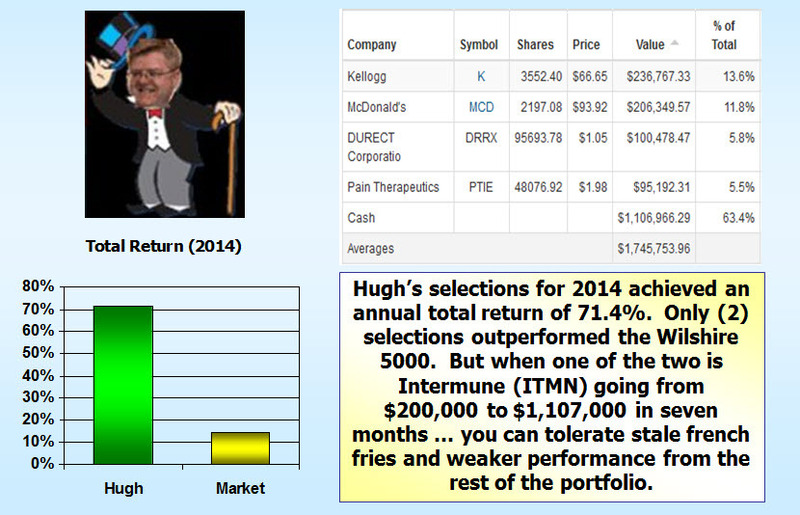 Morningstar thinks United Health (UNH) is overvalued, too. S&P is scratching their heads over Exxon Mobil (XOM) and Chevron (CVX) … and we’ll stay tuned to see what conclusions are reached by Team Stovall.